A student’s first year at a new college is a critically important period—academically, socio-emotionally, personally, and professionally. Whether transitioning from high school, other postsecondary education, or the labor market, students often need to adjust to a myriad of changes beyond just the new academic environment. They may be relocating, starting a new job in order to pay for tuition and living expenses, or facing new demands as they balance family responsibilities, work, and school deadlines. Students learn to navigate new institutional processes and support structures at their campus and form a new social support network. They also may need to learn about complex institutional policies regarding transferring credits between institutions. Simply put, students’ experiences during their first year at a higher education institution are challenging and play an important role in setting them up for future success. The academic and practitioner literature on the transitional challenges of first-year students at four-year sector in the United States goes back over a century. In the 1980s, a national “first-year experience movement” blossomed, leading to increased research and practice aimed at supporting universities students during their freshman year. More recently, two-year institutions have increasingly been adopting first-year practices and programs, in part based on empirical and anecdotal evidence from the four-year sector. However, the history of such programming designed specifically for first-year students in two-year programs is less well-documented than that of the four-year sector, and deserves further attention. Students who enter two-year programs stand to benefit from targeted supports early during their postsecondary trajectories at a given institution. Irrespective of prior academic preparation, these students have disproportionately low retention and credentialing rates and tend to face significant challenges to degree completion. First-year experience programs and activities are explicitly designed to retain students, as well as improve learning and program completion—goals that are well-aligned with the needs of the two-year sector. However, the same conditions that negatively impact achievement, retention, and graduation among two-year students may pose obstacles for engaging them in traditional first-year programming or services in ways similar to the more traditional four-year students for whom these programs were originally developed. Part-time enrollment and/or distance learning, off-campus residence and employment, and significant family and work obligations complicate an institution’s ability to reach two-year students with the same level of scale and intensity required to observe institution-wide impacts. Additionally, the transfer- and or career-focused mission of two-year institutions, along with the shorter nature of their students’ intended academic program, create unique needs and opportunities for first-year programming that are simply absent from the four-year space. The nature of institutions that serve two-year students, and the recent history of first-year programming in that space, leave us with questions about how and what activities or practices these institutions choose to adopt, how they target their “first-year” services when their programs are shorter-term and the majority of their students embark on nontraditional credentialing pathways, and the main challenges they face in the process. This paper aims to begin answering these questions by exploring the national landscape of first-year programming and practices at institutions that primarily serve associate degree-seeking students, or “two-year” students. It complements existing studies on the topic by contributing to the documentation of the prevalence and features of first-year practices at two-year institutions, and extends these studies by exploring how institutions organize their first-year programming and how such programming varies based on institutions’ characteristics. By understanding national trends and patterns among this group of institutions, we hope to not only inform two-year practitioners about the current state of practice, but also to highlight challenges and strengths within the two-year sector and the opportunities for further research to better support first-year programming for two-year students. We begin with a high-level review of the academic and practitioner literature on first-year supports, with a focus on the two-year sector. Next, we report the results of a new, national survey of institutions serving two-year students, presenting key trends and lessons learned on the scope of their first-year programming, which we complement with information gathered from interviews with a small subset of those institutions. We also present findings regarding first-year programming targeting specific subgroups of students, including high-achieving, low-income students. Overall, first-year programming is very common among the 174 public institutions that participated in our survey. They all offer their students at least one of 11 researcher-identified first-year activities or services, with an average of six activities per institution. Orientation and first-year seminars or success courses are the most common offerings, present at 95 and 87 percent of the institutions respectively. The least common activities include college readiness surveys and first-year mentor programs, offered at 14 and 22 percent of institutions respectively. A sizeable minority of participating institutions (40 percent) report offering a coordinated program that serves first-year students or a similar population (FYE program). While our sample is representative of the 1,027 public institutions identified as eligible for this study on a number of institutional characteristics, it may overestimate the extent to which first-year activities and services are made available to two-year students at the national level due to self-selection. Sampled institutions that offer an FYE program define eligible first-year students, or the “similar” target student population, based on their first-time college status in general or at the institution, the number of credits they have already completed, and/or their level of college-readiness based on student demographics or achievement. These institutions differ from those without a formal FYE program in a number of ways. They offer an additional 1.5 first-year activities on average, and are especially more likely to offer less common first-year programming that is backed by some experimental evidence of positive impacts on student outcomes in the two-year context (e.g. mentor programs, summer bridge programs, learning communities, and corequisite developmental coursework). They are also more likely to require their first-year students to participate in career services and to offer first-year seminars that focus on professional or career-based content. Additionally, institutions with an FYE program are more likely to offer programming that is targeted specifically to subgroups of underserved students, including low-income, low-performing, and high-achieving students. As a group, our survey respondents identified insufficient financial resources and resistance to change among faculty or staff as the most common obstacles to improving first-year programming at their institutions. Institutions with an FYE program were also more likely to cite obstacles pertaining to infrastructure challenges and institutional politics. This suggests that developing and running FYE programs may highlight challenges surrounding particular institutional structures and resources, or may potentially strain existing structures and resources at institutions that serve two-year students. Lastly, the results suggest that institutions do not significantly tailor their first-year programming to the two-year context. For instance, activities that are backed by some experimental evidence in the two-year space are uncommon, and transfer- and career-related components are not strongly featured. Survey findings, backed by interviews with select institutional administrators regarding the structures and features of FYE programs suggest that coordinating first-year practices through a dedicated program or department may assist two-year institutions in providing more mission- and evidence-driven services for their particular student populations. To that end, they may also especially benefit from conducting within-institution research and data analysis to inform their programming decisions. Contemporary programming for first-year students at four-year institutions can be traced back to the “first-year experience movement” that took root in 1970s. The movement was prompted by the revival and revamping of the first-year seminar and grew to encompass a range of academic, socioemotional, practical, financial, and professional services for first-year students, as well as accompanying empirical research studies. The large body of research that has accompanied the first-year experience movement focuses mainly on four-year institutions and finds mostly positive associations between first-year practices and a wide range of student outcomes. The research often cites the American Association of Colleges and Universities’ ten high-impact practices, which include first-year experiences, and are recommended to increase student engagement, learning, and retention. There are several challenges to precisely estimating how a given practice or program impacts different students, and to generalizing findings across contexts. A key challenge involves measuring the impact of practices that are not uniformly defined or implemented within and across institutions. There are significant variations in the naming, structure, content, and goals of first-year supports for students, as well as to whom they are offered and how they are coordinated with other institutional efforts. This lack of standards complicates the definition and study of first-year programming and first-year programs, and consequent recommendations for practice in different contexts. Despite the challenges in identifying and studying first-year practices and programs in a standard fashion, the literature nonetheless identifies and broadly defines a set of the most prevalent first-year activities and practices that have been generally associated with increases in retention, credit accumulation, academic achievement, and/or engagement, mainly among four-year students. We describe these activities below along with findings regarding their prevalence at two-year institutions, and impacts on student outcomes, when available. Information regarding the prevalence of these first-year activities is derived from a 2017 survey of 525 two- and four-year institutions and a 2012 national survey of student success practices at 286 non-profit two-year institutions. Summer bridge programs aim to get first-year students up to speed prior to the start of the regular academic year. At two-year institutions, they focus on promoting academic readiness and exposing students to expectations for college-level courses. They may offer similar introductions to campus resources as orientation, as well as provide developmental or accelerated coursework either through tutoring, classroom-based instruction, or workshops. An experimental study of eight summer bridge programs found a positive impact on two-year students’ course completion in math and writing during the first 18 months after the program ended, with no effects on student persistence or number of credits earned. Koch and colleagues found that 30 percent of the two-year institutions they surveyed offered summer bridge programs, mostly at large institutions with over 10,000 students. Orientation sessions typically introduce new students to campus resources, services, and facilities, and offer academic advising and course registration. They often also include placement testing and opportunities for getting involved in campus-related events or activities. Survey findings suggest that between 59 and 98 percent of two-year institutions offer at least some form of orientation for students. Young finds that orientation at two-year institutions is more limited in scope than at four-year institutions, rarely including sessions for family members, health and wellness counseling, and opportunities for structured interactions with faculty. Sometimes referred to as student success courses, these seminars help to build social support networks and teach soft-skills and college know-how to first-year students. They might also include some elements of career planning, goal-setting, and an introduction to academic writing and other college-level skills and knowledge. Given their long history, first-year seminars at two-year institutions have received special attention, and research findings point to positive associations with a number of student outcomes. For example, a regression study involving over 20,000 Virginia Community College System students found that enrollment in a student success course was positively associated with short-term credit accumulation and second year retention, after controlling for student demographics. In another study that used propensity score matching to assess the impact of participation in a redesigned student success course at Bronx Community College, participating students showed higher grades and persistence compared to otherwise similar peers, even up to two years after the course ended. A random assignment study of developmental education students at Guilford Technical Community College found similar gains for students who participated in the college’s student success course, although these gains faded over time. Survey findings suggest that between 59 and 80 percent of two-year institutions offer first-year seminars. Young reports a decrease in the prevalence of first-year seminars across the board in recent years, including at two-year institutions. He attributes this to increasing diversification in first-year activities on campuses, a move away from orientation-focused seminars and toward other programming, and potential skepticism regarding the value of the first-year seminar. Proactive advisement gives students an opportunity to work with a dedicated professional to set academic and professional goals and plan out their curricular pathway to graduate on time. This may involve the use of customized degree plans or a guided pathways approach to structure students’ trajectories toward program completion, whereby students are provided with highly structured plans for entering the college, and for choosing and efficiently completing programs that align with their personal goals. Some advising systems also have early alert systems that notify students, faculty, and/or advisors when students are at risk of falling behind academically or not progressing in a timely manner. Proactive advisement, early alerts, and guided pathways can help structure and streamline two-year students’ administrative and academic experiences as they progress through the institution, thus reducing important institutional barriers to success for this student group. Young finds that first-year advising is the most common type of FYE programming at two-year institutions, and that early alert systems are also prevalent. Koch and colleagues’ survey revealed that 93 percent of two-year institutions monitored their first-year students through early academic alert systems, most of which are partially or fully based on faculty and staff (vs. technology). In terms of impact, a large random assignment study of eight institutions, including two-year colleges, found that students who received proactive and data-informed coaching had significantly higher retention and graduation rates than their counterparts. Designed for students in the same entry cohort, degree program, or major, learning communities create a set of linked courses for a group of students, which may or may not include a first-year seminar course or interdisciplinary curriculum. Learning communities provide a built-in set of academic supports as well as a peer network for students, helping them to socially adjust to the college environment. Koch, Griffin, and Barefoot found that 23 percent of their sampled two-year institutions offered dedicated first-year learning communities, and Young also found it to be a less common first-year practice more generally. A randomized trial of a one-semester learning community in developmental education found that participating two-year students increased their credit accrual in the target subject (English or math) as well as their total credits accrued, although the program had no impact on student persistence. In another community college study, students who enrolled in a pair of courses linked through their learning community had lower course attrition rates, higher grade point averages, and higher term-to-term retention rates than their counterparts who enrolled in these courses with the same professor but separately from a learning community context. First-year social programming aims to help students build meaningful relationships on campus with peers and faculty and to gain emotional, academic and/or career development outlets. Social programming includes faculty or peer mentoring as well as organized social networking events. Sometimes these social support networks are targeted specifically to at-risk populations, but can also be designed for all first-year students. According to Young’s survey findings, mentorship programs are offered by just under a third of the surveyed two- and four-year institutions, classifying them among the least common FYE initiatives. An experimental study of over 2,000 students across 100 community colleges found modest positive impacts of light-touch mentorship programs on student outcomes. Math course sections were randomly assigned to include a mentorship component, whereby trained staff members delivered information about support services to students through the classroom, served as a direct personal connection for students in the class, and communicated with course instructors to identify and assist struggling students. The mentorship program led to a significant decrease in course attrition although it had no significant impact on course pass rates or retention rates in the next term. For developmental and part-time students however, the mentorship program had significant positive impacts including higher course pass rates and higher credit accumulation. In sum, our review of the research suggests that two-year institutions appear to be adopting numerous prevalent first-year practices, though to varying degrees. It also suggests that while there is limited empirical evidence regarding the impact of first-year curricular, co-curricular, and non-academic supports on two-year students’ outcomes, the existing findings hold some promise. In particular, some experimental and quasi-experimental studies find that specific iterations of first-year mentorship programs, summer bridge programs, first-year seminars, and learning communities have positive impacts on course retention or completion. The Center for Community College Student Engagement (CCCSE) specifically identifies first-year seminars, learning communities, and orientation, in particular, as promising practices in the two-year context. It also identifies accelerated developmental education as another key component of improving the first academic year at two-year colleges, given that almost two-thirds of entering students need at least one remedial course to advance on to college-level coursework. Pilot and system-wide implementation in the community college context, as well as a randomized controlled trial study, indicate that corequisite developmental coursework increases the chances of students enrolling in and finishing college-level coursework, and accumulating college credit. The first-year activities and practices described above may be offered in concert with each other, or blend components of programs that we have described as separate. For instance, learning communities often include a first-year seminar or success course, as well as structured and unstructured activities to provide or enhance social integration and supports. Similarly, first-year seminars may involve components from orientation, advisement, and mentorship programs. On one hand, this fluidity and versatility in first-year programming allows it to be tailored to the students and the context. On the other hand, it complicates administration within an institution—with a risk of overlapping programs duplicating efforts or confusing students—and makes it far more difficult to define and study first-year programming in a consistent way. To address this complexity, institutions have begun combining co-curricular and non-curricular first-year student support services into intentional, comprehensive, and integrated “first-year experience” (FYE) programs for improved reach and impact. Such programs are distinguished from discrete first-year activities or services (or “first-year programming”) by intentionally combining efforts across an institution through campus-wide or inter-departmental coordination and cooperation, in ways that span the entire curriculum and co-curriculum. By virtue of its reach across varied departments and staff members, such holistic coordinated programming can also promote an institutional culture that prioritizes first-year supports and subsequently contributes to sustainable systems change that cannot be achieved through standalone activities. Despite this distinction, practitioners and researchers often use the terms “first year experience” or FYE program to describe one particular initiative or service, rather than a coordinated effort with multiple practices that span the institution and curriculum. Additionally, a recent survey of 525 institutions in the nation finds that the majority do not have a first-year program office or highly coordinated first-year programming. A study of Purdue University’s first-year programming lends some support to the assertion that coordinated, holistic FYE programs have a greater impact than stand-alone first-year services. After controlling for students’ prior academic preparation, academic success, and demographic characteristics, the study found that students who participated in multiple supports that are coordinated through a dedicated program had significantly higher three-year retention rates than their counterparts who participated in a standalone activity. Among institutions that serve two-year students, the early successes of Guttman Community College’s comprehensive FYE program and Valencia College’s New Student Experience program are also promising. Guttman’s program, for instance, combines summer bridge programs, learning communities, corequisite developmental coursework, guided pathways, a college success course, and an advising workshop, all supported by broader cross-institutional structures and supports. Early findings indicate that two- and three-year graduation rates among the first cohort of full-time students (28 and 49 percent) are substantially higher than those of full-time students at all CUNY colleges (4 and 17 percent). Similarly, Valencia’s program incorporates college success skills, career and academic advising, and guided pathways into the first-year seminar, which is also aligned to broader institutional practices and strategies. According to early survey findings, students report that the program helped them to connect with faculty, improve their communication and interpersonal skills, better manage their time, and better understand their own strengths, values, and goals. Currently, there is no information on the prevalence of coordinated FYE programs among institutions serving two-year students, and how first-year programming may differ accordingly. Gaps in the literature also exist regarding variations of first-year programming based on institutional characteristics in the two-year space, and the perceived challenges to such programming among administrators in that space. Next, we turn to the results from a new national survey of practices to begin addressing these gaps in knowledge surrounding first-year programming for two-year students. We developed a survey of first-year programming for two-year students with the goal of capturing the prevalence of key first-year practices identified in the literature, coordinated FYE programs that serve first-year students, first-year programming for specific subgroups of students, and potential challenges to first-year programming. In order to maximize the survey response rate, we developed a short online survey and ensured that all items were relevant to institutions regardless of the presence of a formal first-year experience program or their level of first-year programming. Administrators with first-year programming expertise from three two-year institutions piloted the survey prior to its administration in the fall of 2017. We used IPEDS 2016-2017 data to identify institutions that primarily grant associate degrees and that conferred at least 20 associate degrees in 2016. This yielded a total of 1,551 institutions across 50 states and six U.S. territories, and includes four-year institutions that grant large numbers of associate degrees. Because there is no directory for administrators responsible for first-year programming per se, identifying appropriate survey recipients and their contact information proved challenging. We conducted our contacts search and survey administration in a series of steps. We first identified 247 individuals from 240 institutions through the Two Year First Year (TYFY) contact list, which includes TYFY members and conference attendees, as well as manual entries of contacts identified as potentially responsible for first-year programming at two-year institutions. Next, we identified 1,090 contacts from 694 institutions through the American Association of Community Colleges 2017 membership directory, which includes student services officers and academic affairs officers. We also conducted manual searches for institutions with no contact information, and identified administrators at 182 institutions who would likely be well-informed about first-year programming (e.g. Director of Student Success, Dean of Students, or Vice President of Student Affairs). These manual searches prioritized two-year institutions, institutions that awarded the largest number of associate degrees, as well as for-profit institutions due to their severe underrepresentation in our database at the time. Lastly, we gathered references for contacts from 17 institutions through the survey itself, which allowed respondents to direct us to an alternate staff member. We sent survey invitations via email to potential participants at 1,141 eligible institutions, and received 123 completed surveys. In parallel, we also publicized the survey online through social media and by requesting the support of relevant organizations (e.g. state or member associations, advocacy organizations) which yielded additional responses from 64 eligible institutions. The survey was in the field between November 2017 and March 2018. We received complete or near-complete survey responses from 187 institutions (12 percent of the initial pool of 1,551 target eligible institutions identified for this study), located in 44 states and two U.S. territories. Public institutions were significantly overrepresented among our survey responses, consisting of 93 percent of our original sample, while public institutions make up 66 percent of the pool of eligible institutions. This overrepresentation is in large part due to challenges contacting individuals at private for-profit institutions that tend to omit staff information from their websites and publicly available documents. Given the large differences in funding structures, recruitment strategies, and student enrollment and demographics across the public and private sectors more generally, and the lack of representation of private institutions in our sample, we restrict our analyses to public institutions only. Our final analytic sample consists of 174 public institutions serving two-year students (seventeen percent of the pool of 1,027 eligible public institutions identified for this study). Table 1 provides descriptive information for our restricted analytic sample, as well as for the eligible sample of public institutions. Table 1. Descriptive information for study sample and study-eligible institutions. Most of the sample consists of two-year and medium-sized institutions. In 2016, most enrolled between 1,000 and 10,000 students (72 percent) and conferred between 101 and 500 associates’ degrees (82 percent). Most have a student body that is majority part-time, and that is at least one quarter adult (students aged 25 to 64 years). Half of the sampled institutions are located in or near urban areas and half in towns or rural areas, and the majority are classified as serving a high proportion of career-focused students (vs. transfer-focused or bachelor-degree-seeking). The institutions sampled in the present study are representative of the broader population of similar institutions in the U.S., with a slight underrepresentation of transfer-focused or bachelor-granting institutions. Respondents were asked to indicate whether their institution has a stand-alone first-year experience program, office, or department that is specifically dedicated to helping students in the first year of a two-year degree program, or that has a similar mission (FYE program). We chose this broad definition of an FYE program because both research and anecdotal findings suggest that coordinated first-year services in the two-year space are often packaged under different formats and titles. Additionally, defining “first-year” students is especially challenging in the two-year context where many students cannot be easily assigned to, or do not identify with, a particular program “year.” At Salt Lake Community College for instance, the “first-year student” label carries a stigma among new students with previous college experience, and the college’s broad and comprehensive offerings mean that students in their “first year” have a very wide range of experiences, earned credits, and completion pathways. As such, the institution’s FYE program intentionally focuses its services on “new students” instead of “first-year” students. A total of 70 respondents indicated that their institution has an FYE program (40 percent). More than half of these institutions (n=47) identified their FYE program as explicitly and intentionally focused on first-year students, while 23 institutions reported programs that are similar in their mission (e.g. New Student Program). On the other hand, most institutions without an FYE program have no plans to develop one or have actually discontinued such a program in the past (63 percent). A small group of 15 institutions reports having plans to develop an FYE program in the future. As a group, institutions offering FYE programs are significantly larger and are more likely to be located in or near an urban area. They are also slightly more likely to be transfer-focused or bachelor-granting institutions (vs. career-focused). Table 2 presents information on how the FYE programs at the sampled institutions are administered and evaluated. They are most often housed in the institution’s Student Affairs department, Academic Affairs department, or both (86 percent), while a minority are housed in or across other departments/offices. As previously discussed, experts emphasize the importance of institution-wide collaboration and coordination in the development and delivery of first-year experience programming as an integrated and cohesive strategy. Although housing a program in one particular department does not preclude inter-departmental coordination, cross-departmental administrative oversight of programs suggests heightened collaboration and integration, and it is noteworthy that only a minority of the programs (17 percent; n=12) are overseen administratively by multiple departments or those that appear to be founded on inter-departmental collaboration (e.g. “Office of Institutional Effectiveness & Student Success”). Most of the FYE programs (80 percent) generally target students who are attending college for the first-time, or students who are new to that particular institution (including, but not limited to, first-time college students). A little over a quarter of the programs target their FYE activities to students who are in the first term or year of their program (e.g. have earned fewer than 15 or 30 credits), and nearly a quarter target degree-seeking students specifically. A smaller group of FYE programs target students who are enrolled full-time only. Additionally, a handful of institutions described other eligibility criteria for program participation. For example, one institution targets its program to first-generation students from underrepresented minority groups that were placed in developmental coursework. Another institution requires all students who are new to the institution to complete the first-year seminar, but offers first-year advising only to students who have completed less than 30 credits. Most programs are automatically available to all eligible students or all students at the institution with no application process (83 percent). The vast majority of institutions with an FYE program collect student data to evaluate its effectiveness. More specifically, they rely mainly on term-to-term and/or year-to-year student retention rates (90 percent). Institutions rely to a lesser extent on students’ first-term or first-year GPA, their completion of (or enrollment in) gateway courses, their credit accumulation during the first term or year, and their full-time enrollment status. A little over a quarter of respondents reported “other” or additional data points for evaluating their FYE programs, including student program perceptions and satisfaction, specific class enrollment behaviors, pre- and post-program knowledge test scores, student learning outcomes, and students’ graduation or degree completion/transfer outcomes. These data suggest that institutions’ programs focus primarily on improving student retention at their institution, which is in line with the early and on-going focus on the retention-enhancing prospects of first-year programming among four-year institutions. Nonetheless, a smaller but sizeable group of institutions with an FYE also focuses on course, credit, or program completion (68 percent). At San Jose City College for example, the Caminos Summer Bridge and FYE program was developed from the onset with the goal of shifting the completion rate among underprepared entering students from 34 percent in six years to 70 percent in four years. The program measures student retention and course completion rates in the interim, in anticipation of measuring four-year completion rates for its first FYE program cohort. Irrespective of the presence of an FYE program, all survey respondents were also asked to identify whether their institution offers its first-year students any of 11 common first-year activities and services. This includes those made available to first-year students, even if they were not specifically designed or targeted for them. Table 3 presents descriptive information for the 11 activities or services listed, individually and on average, for the full sample as well as for institutions with or without a program. All of the sampled institutions offer at least one of the 11 listed activities, and as a group they offer an average of six activities per institution. The most commonly offered activities across the sample include first-year orientation, first-year seminars or success courses, career services, proactive advisement or interventions based on early alerts, and social events or networking opportunities. The least common first-year activities offered by respondents’ institutions are college readiness surveys, mentor programs, and summer bridge programs. Young also finds that a majority of two-year institutions (more than 50 percent) offer orientation and first-year seminars, and have early alert systems in place. Similarly, they report lower rates of mentor and summer bridge programs. Table 3. First-year programming activities at the sampled institutions, by FYE program availability. * Significantly different at the p < .05 level. Figure 1 provides information on how the 11 different activities correlate with each other in our sample. The correlations suggest that first-year orientation, first-year advising, and customized degree plans or guided pathways tend to be co-offered at the sampled institutions. These three activities focus on providing students with institutional know-how and general college success skills. Additionally, summer bridge programs, learning communities or cohort courses, and proactive outreach based on early alerts correlate with each other. These three activities focus on preventive support and personalizing the college experience for students. Such clustering suggests that institutions may intentionally focus on particular activities that are aligned with an institutional goal or mission, regardless whether they combine them under an umbrella program. Figure 1. Correlation matrix of 11 first-year programming activities at the sample institutions (N=174). Unsurprisingly, institutions with an FYE program offer significantly more first-year activities and services than their counterparts without such programs. More specifically, they offer an average of 1.5 additional activities. 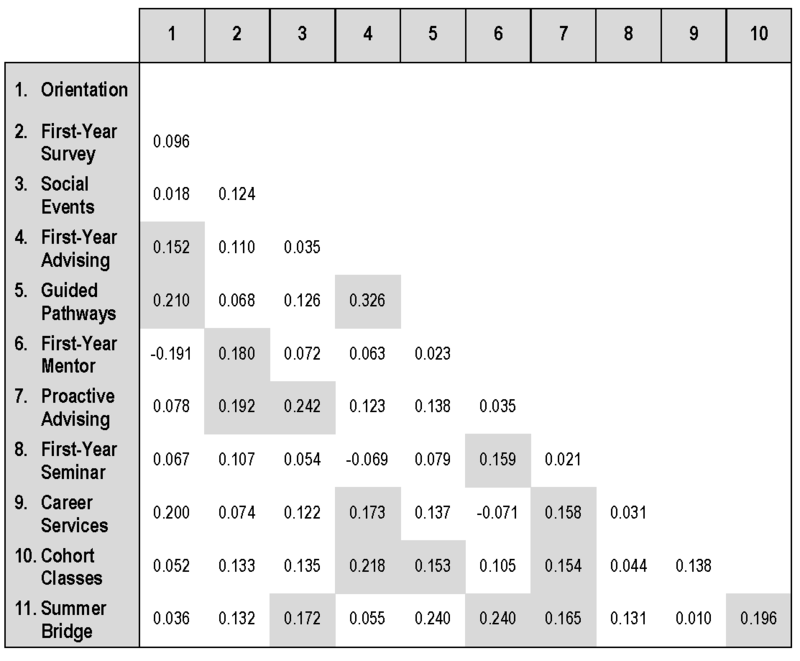 Follow-up analyses indicate that the presence of an FYE program is positively associated with the number of first-year activities offered at an institution even after controlling for institutional size or urbanicity, both of which are also positively associated with the number of activities offered. Institutions with an FYE program differ from their counterparts as well in the type of activities they tend to offer first-year students—they are significantly more likely to offer first-year mentor programs, summer bridge programs, first-year advising, social events or networking, customized degree plans or guided pathways, and cohort classes or learning communities. Additionally, institutions with a program are especially likely to offer corequisite developmental coursework to their first-year developmental students. It is noteworthy that a number of activities and services that institutions with FYE programs are more likely to offer are backed by experimental evidence of a positive impact on student outcomes at two-year institutions (e.g. mentor programs, summer bridge programs, and learning communities). For example, San Jose City College’s FYE program combines a number of such evidence-supported practices. It starts with a summer bridge program for underprepared students (after active recruitment from local high schools), and includes developmental instruction by faculty members trained in active learning techniques, as well as a college orientation course taught by dedicated counselors, small-group supplemental instruction sessions, and a peer mentorship component. The program also includes networking opportunities with faculty, staff, and peers through regular structured and unstructured social events. The summer bridge students form a learning community of sorts when the formal academic year begins, by participating in a fall and spring guidance course. They are also required to meet with their counselors multiple times during their first year and are proactively contacted by their counselors based on targeted early alerts. The survey asks respondents to provide additional information regarding the first-year activities and services their institution offers its students. When offered, first-year orientation and first-year advising are most often required of at least some, if not all, first-year students (81 and 89 percent respectively). A small group of institutions (18 percent), however, does not require any first-year students to attend first-year orientation or first-year advisement. These institutions offer fewer first-year activities and services on average, but do not appear to differ from other institutions in terms of institutional size, location, or transfer or career focus. Another first-year activity that is often required of at least some first-year students is the first-year seminar, or college success course. Eighty-one percent of institutions that offer first-year orientation, advising, and/or seminars have a participation requirement. Similarly, 77 percent of institutions that offer guided pathways or customized degree plans require some or all students to engage with that service. On the other hand, participation in a first-year mentor program or in career services is mostly optional for first-year students at the surveyed institutions. Interestingly, institutions with or without an FYE program do not differ in their requirements for student participation in first-year activities with the exception of participation in career services offerings. Institutions with a program are significantly more likely to require at least some of their first-year students to participate in career services than their counterparts without a program (44 vs. 27 percent), irrespective of the institutions’ focus on transfer- or career-bound students. Additionally, institutions do not differ in their requirements for participation based on the share of part-time students enrolled, suggesting that such requirements are not a function of student availability on campus. We asked respondents follow-up questions regarding the features of their institutions’ first-year seminars, first-year advising, and career services for first-year students (see Table 4). A large majority of institutions offer first-year seminars or success courses to their students. Notably, 70 percent offer such courses fully online. Two-year institutions are especially likely to offer online courses, as well as online student orientation sessions, to cater to their non-traditional student population and to cut costs. All institutions that offer first-year seminars cover college success content, with curricula that focus on numerous components including study skills development, orienting students to campus resources, student self-exploration/personal development, college engagement/belonging, and academic skills development among others. Seventy-one percent of sampled institutions also offer courses that cover professional or career-based content (e.g. skills-based content, cover letter and resume writing, career exploration content), whereas close to half cover academic content (e.g. specific academic subject matter with academic/curricular content). The first-year seminars at the sampled institutions appear to be versatile and rich, with 84 percent incorporating five or more different types of components. Middlesex Community College’s “First-Year Experience/Interdisciplinary Studies” seminars exemplify the versatile and diverse offerings of these courses. The college offers nearly 20 one-credit seminars that focus on different topics, and can stand alone or be paired with a standard introductory course or linked to a first-year learning community. The seminars include multiple guest speakers from different divisions of the college, introducing students to information and contacts from Advising, Financial Aid, Tutoring, Career Services, Disability Support, and Counseling offices that can provide them with added support. Much of the seminar is focused on career planning and students’ self-assessment to understand their curricular and professional goals and how to achieve them. Additionally, the seminars incorporate peer mentorship by pairing older students with first year students to help them establish a social support network and develop relationships that connect them to campus resources. The majority of sampled institutions also offer career services to their first-year students. These services most often include career assessments, career fairs or employer visits to campus, career counseling, and an online career exploration tool. These institutions are less likely to offer placement support for internships, externships, or apprenticeships, and even less likely to offer career success courses. Institutions with an FYE program are more likely to require some or all first-year students to participate in their career services. Although this may partly be a function of their more urban locations, which may offer a larger number of accessible employers than non-urban areas, the finding also holds true among urban institutions only and suggests it may be a feature or result of the coordinated program. Institutions with an FYE program are also more likely to offer first-year seminars that focus on professional or career-based content, suggesting overlap between their first-year seminars and career services offerings. This is aligned with overall FYE programming goals of bridging first-year practices across an institution. Lastly, first-year advising is offered at 95 of the sampled institutions, and most often covers academic planning and major selection, as well as career exploration, transfer exploration, and understanding developmental coursework. It less often covers personal college financing or time-management skills. It is important to note that the survey does not collect information regarding the extent to which each of these components of first-year advising is actually implemented or addressed with first-year students. The survey asks respondents about whether their institution offers first-year programming or activities designed specifically for particular subgroups of first-year students. The goal of this section of the survey is to further understand how first-year activities are directed to students across the institutions, and to gauge institutions’ priorities regarding providing support to their first-year population. This is especially relevant in the context of community colleges, where limited funding may require institutions to target their first-year offerings to subgroups of their first-year student body. Overall, two thirds of the surveyed institutions that provided a response to this section (68 percent; n=173) report offering first-year programming for at least one specific subgroup of students. Close to half of the sampled institutions (45 percent) offer targeted first-year activities for at least one subgroup of students typically identified as academically at-risk (i.e. first-generation students, low-performing students, and students with financial need). Conversely, a smaller but noteworthy proportion of institutions (24 percent) offer targeted first-year programming to their high-achieving students. Targeted first-year programming is also offered to veteran students (39 percent), students with disabilities (32 percent), Latinx and/or African American students (29 percent), and students that identify with particular gender identities (e.g. female students, male students, or LGBTQ students; 28 percent). Institutions that offer an FYE program are significantly more likely to offer targeted programming to most of these different subgroups of students than their counterparts. Because first-year programming has historically focused on supporting students who are academically at-risk, it is worth further examining how the sampled institutions support their first-year high-achieving students. Academically talented students in two-year programs are especially well-positioned for success, and also stand to benefit from strong early targeted financial and advising supports. Table 5 presents descriptive information on program offerings among the 42 institutions that target first-year support services to their high-achieving students. The majority identify eligible students based on their high school GPA or rank, placement test scores, and/or first term outcomes (95 percent). Nonetheless, many institutions identified additional or other eligibility criteria or processes, including transfer GPA that is above a certain cut-off (n=10), special application processes or interviews (n=4), or results from a college readiness student survey (n=2). This may be in part due to the specific requirements of merit-based scholarships and programs. The majority of these 42 institutions offer the targeted activities to all their high-achieving students, which consist mostly of honors programs and/or targeted merit-based scholarships. About half of the institutions offer needs-based scholarships and/or tuition or fee discounts, though not as part of a targeted program for high-achieving students who are also identified as low-income. Fewer than 20 percent of the 42 institutions with programming designed for first-year high-achieving students offer more specialized targeted activities, such as specialized career services, mentorship programs, or transfer-out exploration or support. Lastly, respondents were asked to identify whether any of a list of eight researcher-identified challenges slow down or impede the improvement of programming for first-year students at their institution. Overall, respondents identified an average of two challenges. Table 6 presents responses for the 163 participants who responded to this question. Unsurprisingly, most identified insufficient financial resources as one challenge. To a much lesser extent, they identified resistance to change among college faculty and/or staff, inadequate physical or technological infrastructure, and institutional politics as additional challenges. Lack of guidance or direction from the state system office was the least common reported challenge. A small group of respondents also reported additional challenges in the open-ended section of the question, namely staffing challenges or insufficient human resources (n=6), low student participation in activities and services (n=4), and initiative fatigue (n=2). San Jose City College’s experience with its FYE program offers an example of how securing faculty buy-in of non-traditional practice, along with technical infrastructure considerations and institutional politics, can serve as challenges to first-year programming. Their summer bridge program requires that faculty participate in a professional development course (and thus be assigned to the summer courses much earlier than usual), that they commit to longer hours with students, and that they subsequently use an early alert system to help the program follow-up with students proactively. Buy-in had to be carefully negotiated, in part due to union contracts and faculty having to adopt new practices and technologies for just one program. The adoption of early-alert technology across the college would assist with faculty buy-in and follow-through to further support the FYE program’s goals. However, because the effective implementation of early alert technology requires large scale IT and organizational infrastructure change, it cannot be achieved successfully without system-wide adoption and buy-in from the institution’s sister college first. Nearly a quarter of respondents (23 percent) report that insufficient information about best practices for working with first-year students in two-year programs poses a challenge for their first-year programming. Interviews with select first-year programming administrators suggest that they feel generally aware of what their student population needs and what programming they would like to offer to that end. In the absence of enough evidence regarding the impacts of first-year programming on two-year students’ outcomes, it is expected that administrators will draw on findings from four-year institutions as well as anecdotal evidence, and collect their own institution-specific data to guide them. This may create a challenge for the field, and organizations like TYFY, to promote research and the subsequent adoption of evidence-based best practices. In the interim however, two-year institutions may especially benefit from conducting within-institution research and data analysis to inform their programming decisions. Although such practices do not build a set of sector-wide best practices or knowledge base in the short-term, they may promote the development of practices that are especially relevant to subsets of two-year students and their institutions. At Fayetteville Technical Community College for example, administrators revamped their first-year seminar by collecting and using data on student retention, loan default, and graduation rates, as well as interview data. Their analysis showed that first-year students placed in developmental coursework, for whom the credit-bearing first-year seminar was originally developed, were withdrawing or failing at large rates and subsequently leaving the institution. Subsequent interviews with students and faculty members shed light on issues regarding the content of the seminar, which did not match students’ existing strengths or outstanding needs and was changed accordingly. For instance, the college’s large military or veteran student body was well-versed in time-management and note-taking, which were covered in the original seminars, but lacked the information and skills needed to navigate college policies and requirements, which were not covered. Since those changes, the college has experienced notable increases in course and term-to-term retention rates, while student loan default rates have decreased. It is noteworthy that respondents from institutions with an FYE program were significantly more likely to report challenges pertaining to insufficient financial resources, an inadequate infrastructure, and institutional politics. Differences in reported infrastructural and political challenges in specific are similar across institutions that are urban or rural. This finding deserves further research, as the necessary supports and solutions for barriers to effective first-year programming may differ across institutions based in part on the presence or absence of a holistic FYE program. It is possible that administrators who have been involved in developing and administering a coordinated program are especially aware of the infrastructural and political challenges involved, beyond the initial issues of funding and buy-in. It is also possible that establishing and maintaining a program strains institutions in some additional ways, with potential unintended impacts on other programs or efforts at the institution. Our findings indicate that, generally speaking, first-year programming is very common among the sampled public institutions that serve two-year students (N=174). A sizeable minority offer a coordinated FYE program (40 percent), and the vast majority offer at least two different types of first-year activities that go beyond the initial orientation process (90 percent). The most common such activities include first-year seminars, which are the foundation of the first-year experience movement, as well as career services, proactive student outreach, and social networking opportunities for first-year students. It is important to note that institutions offering robust or salient first-year programming may have been particularly motivated to participate in this survey, such that our sample may overestimate the extent to which first-year activities and services are made available to two-year students at the national level. With that said, it is noteworthy that institutions with a coordinated FYE program offer more first-year activities, and in particular those that are less common and yet more supported through experimental findings in the two-year space. These institutions are also more likely to require their first-year students to participate in career services and to offer first-year seminars that focus on professional or career-based content. Additionally, institutions with an FYE program are more likely to offer programming that is targeted specifically to subgroups of underserved students, including low-income, low-performing, and high-achieving students. These findings suggest that by coordinating first-year practices through a dedicated program or department, institutions may be better able to focus on providing mission- and evidence-driven services in more intentional ways. At Salt Lake Community College for example, the academic affairs, admissions, and advising offices collaborated to repackage and scale existing but fragmented first-year supports into a cohesive FYE program that could better serve more students. Over time, the program and resultant collaboration has allowed the college to create cohort programs for subgroups of at-risk students and incorporate evidence-based practices, such as peer mentoring. Additionally, the presence of a program naturally led to annual data collection and reporting, as well as a five-year review. As a result of these self-assessment and self-reflection processes, the office has begun to focus its efforts on college success, in addition to access and retention, by examining and addressing completion, transfer, and employment outcomes for their students. Although the survey does not address this explicitly, institutions do not appear to significantly tailor their first-year programming to the two-year context. For instance, activities that are backed by some experimental evidence in the two-year space, such as summer bridge and peer mentoring programs are uncommon. It is also reasonable to expect transfer- and career-related components to be strongly featured given that the first year is intended to cover a full half of the student’s trajectory toward those goals. The survey indicates almost none of the institutions place a strong focus on transfer outcomes in evaluating their FYE programs. Additionally, transfer success components are missing from 40 percent of FY seminars, which are among the most common first-year offerings. Transfer success components were not more prevalent at transfer-focused institutions. Although first-year advising covers transfer and career exploration at most institutions that offer this service, first-year advising itself is not especially common in our sample. Additionally, in the absence of a set curriculum, advising may not reach the majority of students with these supports as might be needed. This is also true for high-achieving students in two-year programs, who are especially well-positioned to successfully transfer to and succeed at four-year institutions but do so at low rates. Similarly, although career services are commonly offered to first-year students, they are largely optional and therefore may have limited reach among this particular population. Nonetheless, professional or career-based first-year seminars are offered at 72 percent of institutions—albeit the content and specific goals of these seminars deserve further research. Additionally, 70 percent of institutions offer their first-year seminars online, and the majority of institutions offer accelerated or corequisite developmental coursework. These practices suggest adaptation to the two-year context and may offer insights into how other first-year practices can be further adapted to increase their relevance to the student body as needed. Services that are commonly offered at an institution and lend themselves to interdepartmental input may be especially good springboards for institutions to expand and enhance their first-year offerings. For example, Fayetteville Technical Community College and Middlesex Community College built their FYE programming off of the first-year seminar. Salt Lake Community College built its programming off its orientation and advising programs. San Jose City College, on the other hand, used its summer bridge program as a springboard for expanding its services. How exactly institutions serving two-year students should expand and enhance their first-year programming is beyond the scope of this paper. However, some research suggests that the activities themselves may be less important than the mechanisms underpinning them. As such, two-year colleges could consider constructing a menu of activities in order to support these mechanisms as opposed to adopting particular components for their own sake. In her seminal work on this subject, Karp lays out the four primary mechanisms of non-academic supports as helping students to (1) foster social relationships, (2) identify their goals, (3) build social capital to better navigate campus bureaucracies, and (4) access material supports and connections to services that promote student persistence. For example, both a peer mentoring program and a learning community could help students develop strong relationships, just as “campus know-how” can be taught to students through a summer bridge program, pre-term orientation, or a more extended first-year seminar. To that end, future research should attempt to identify the goals behind discrete first-year activities, both the explicitly stated goals as well as implicit goals gleaned through the activity’s key features and structure, and identify different avenues for reaching these goals within the two-year context. M. Lee Upcraft, John N. Gardner and Associates, The Freshman Year Experience (San Francisco: Jossey-Bass Inc., 1989). Ibid. Betsy Barefoot, John N. Gardner, Marc Cutright, et al., Achieving and Sustaining Institutional Excellence for the First Year of College (Indianapolis: Jossey-Bass, 2005); George Kuh, Jillian Kinzie, John Schuh, Elizabeth Whitt and Associates, Student Success in College: Creating Conditions that Matter (San Francisco: Jossey-Bass, 2005); Ernest Pascarella and Patrick Terenzini, How College Affects Students: A Third Decade of Research (Indianapolis, Jossey-Bass, 2005); Robert Reason, Patrick Terenzini, and Robert Domingo, “First Things First: Developing Academic Competence in the First Year of College,” Research in Higher Education 47, no. 2 (2006): 149-175. Andrew Koch and John N. Gardner, “A History of the First-Year Experience in the United States during the Twentieth and Twenty-First Centuries: Past Practices, Current Approaches, and Future Directions,” The Saudi Journal of Higher Education 11 (2014). Joshua Goodman, Michael Hurwitz, and Jonathan Smith, “College Access, Initial College Choice and Degree Completion,” Journal of Labor Economics 35, no. 3 (2017): 829-867. Andrew Koch and John N. Gardner, “A History of the First-Year Experience in the United States during the Twentieth and Twenty-First Centuries: Past Practices, Current Approaches, and Future Directions,” The Saudi Journal of Higher Education 11 (2014), 13. George Kuh, High-Impact Educational Practices: What They Are, Who Has Access to Them, and Why They Matter (Washington, DC: American Association of Colleges and Universities, 2008). George Kuh, High-Impact Educational Practices: What They Are, Who Has Access to Them, and Why They Matter (Washington, DC: American Association of Colleges and Universities, 2008); Sarah Randall Johnson & Frances King Stage, “Academic Engagement and Student Success: Do High-Impact Practices Mean Higher Graduation Rates?” The Journal of Higher Education, 89, no. 5 (2018), 10.1080/00221546.2018.1441107. Dallin Young, “Presenting Data from the 2017 National Survey of First-Year Experiences” (presentation, Annual First Year Experience Conference, San Antonio, TX, Feb. 10-13, 2018). Sara Stein Koch, Betsy Q. Griffin, & Betsy O. Barefoot, “National Survey of Student Success Initiatives at Two-Year Colleges,” John N. Gardner Institution for Excellent in Undergraduate Education (2014). Elisabeth Barnett et al. “Bridging the Gap: An Impact Study of Eight Developmental Summer Bridge Programs in Texas,” The Developmental Summer Bridge Project (New York: National Center for Postsecondary Research/MDRC, 2012). Sung-Woo Cho and Melinda M. Karp, “Student Success Courses in the Community College: Early Enrollment and Educational Outcomes,” Community College Review 41, no. 1 (2013): 86-103. Melinda M. Karp et al. “Redesigning a Student Success Course for Sustained Impact: Early Outcomes Findings,” Community College Journal of Research and Practice 41, no. 1 (2016): 42-55. Elizabeth Zachry Rutschow, Dan Cullinan and Rashida Welbeck, Keeping Students on Course: An Impact Study of a Student Success Course at Guilford Technical Community College (New York: MDRC, 2012). Judith Scott-Clayton, “The Structure of Student Decision-Making at Community Colleges,” CCRC Brief 49 (2011). Eric Bettinger and Rachel Baker, “The Effects of Student Coaching: An Evaluation of a Randomized Experiment in Student Advising” Education Evaluation and Policy Analysis 36, no. 1 (2014). Susan Scrivener, Dan Bloom, Allen J. LeBlanc, Christina Paxson, Cecilia Elena Rouse and Colleen Sommo, A Good Start: Two-Year Effects of a Freshman Learning Community Program at Kingsborough Community College (New York: MDRC, 2008). Gene Popiolek, Ricka Fine and Valerie Eilman, “Learning Communities, Academic Performance, Attrition, and Retention: A Four-Year Study,” Community College Journal of Research and Practice 37, no. 11 (2013): 828-838. Mary Visher, Kristin F. Butcher and Oscar Cerna, Guiding Developmental Math Students to Campus Services: An Impact Evaluation of the Beacon Program at South Texas College (New York: MDRC, 2010). Center for Community College Student Engagement, “A Matter of Degrees: Practice to Pathways – High Impact Practices for Community College Student Success,” Austin, TX: The University of Texas at Austin, Program in Higher Education, 2014. Ibid, 7; Nikki Edgecombe, “Accelerating the Academic Achievement of Students Referred to Developmental Education,” CCRC Working Paper No. 30 (2011); Sun-Woo Cho et al., “New Evidence of Success for Community College Remedial English Students: Tracking the Outcomes of Students in the Accelerated Learning Program,” CCRC Working Paper No. 53 (2012). Alexandra Logue, Mari Watanabe-Rose, and Daniel Douglas, “Should Students Assessed as Needing Remedial Mathematics Take College-Level Quantitative Courses Instead? A Randomized Controlled Trial,” Educational Evaluation and Policy Analysis 38, no. 3 (2016): 578-598. Ibid, 17-18; Betsy Barefoot, John N. Gardner, Marc Cutright, et al., Achieving and Sustaining Institutional Excellence for the First Year of College (Indianapolis: Jossey-Bass, 2005). Andrew Koch and B. M. Drake, “The Efficacy of a Coordinated, Multilayered, First-Year Experience Program at Purdue University,” in Diane Nutt and Denis Calderon (Eds. ), International Perspectives on the First-Year Experience in Higher Education, Monograph No. 52 (Columbia, SC: The National Resource Center for the First-Year Experience and Students in Transition, 2009). Christina Hardin, “Valencia College Quality Enhancement Plan: The New Student Experience Fall 2014 Report,” Valencia College, 2014, http://valenciacollege.edu/academic-affairs/new-student-experience/documents/NSEFall2014ReportREVISED3215.pdf. Note: We consider these contacts to be “potential participants” because most were not designated contacts for first-year programming, and email addresses could not be verified ahead of survey administration. All additional data about institutions’ characteristics are derived from publically-available IPEDS 2016-2017 data. Respondents were instructed to distinguish FYE programs from stand-alone courses or activities that do not fall under a dedicated program, department, or office. Personal communication with Salt Lake Community College FYE program Director Richard Diaz, on February 5th, 2018. They enrolled, on average, an additional 4,723 undergraduate students in 2016 (M=10,608 and M=5,885 respectively, t(1, 169)=-2.91; p<.01). Sixty-four percent of institutions with an FYE program are located in cities or suburbs, vs. 42 percent of institutions without an FYE program (χ ²= 8.53; p < .01). Forty-eight percent of institutions with an FYE program are transfer-focused or bachelor-granting, vs. 35 percent of institutions without an FYE program (χ ²= 2.85; p < .10). The program was initially funded through a federal Title V: Hispanic-Serving Institutions award. Completion rates among underprepared entering student were defined through the California Community College State Chancellor’s Office Student Success Scorecard. Personal communication with San Jose City College METAS Program Director Robert Gutierrez, and program evaluator Arnold Sanchez Ordaz, on April 6th, 2018. It seems possible that the high rate of first-year advising in in Young’s sample compared to the high rate of first-year orientation we found in our sample, is a matter of differing definitions. First-year orientations tend to include elements of first-year advising and conversely, first-year advising is at times construed as an extended orientation. Although Young’s survey categorized first-year seminars differently than we do, these data are aligned with their finding that the most common objective behind these courses is to improve students’ academic success strategies. Email communication with Middlesex Community College Provost Phil Sisson, in June 2018. With the exception of programming for first-year students based on first-generation status or gender identity. χ ²=6.64 – 11.99; p<.01. Jennifer Giancola and Richard Kahlenberg, True Merit: Ensuring Our Brightest Students Have Access to Our Best Colleges and Universities (Lansdowne VA: Jack Kent Cooke Foundation, 2016). Personal communication with Fayetteville Technical Community College’s Director of Admissions and Counseling, Louanna O. Castleman, on April 25th, 2018. Jennifer Giancola and Elizabeth Davidson, Breaking Down Walls: Increasing Access to Four-Year Colleges for High-Achieving Community College Students (Lansdowne, VA: Jack Kent Cooke Foundation, 2015); Benjamin Fresquez, Tania LaViolet, McKenzie Maxson, and Joshua Wyner, The Talent Blind Spot: The Case for Increasing Community College Transfer to High Graduation Rate Institutions, The American Talent Initiative, 2018. https://doi.org/10.18665/sr.307784. Melinda Karp, “A Holistics Conception of Nonacademic Supports: How Four Mechanisms Combine to Encourage Positive Student Outcomes in the Community College,” New Directions for Community Colleges, No. 175 (Fall 2016): 33-44. Deryl K. Hatch and E. Michael Bohlig,”An Empirical Typology of the Latent Programmatic Structure of Community College Student Success Programs,” Research in Higher Education 57, vol. 1 (2016): 72–98, doi: 10.1007/s11162-015-9379-6. Melinda Karp, “A Holistics Conception of Nonacademic Supports: How Four Mechanisms Combine to Encourage Positive Student Outcomes in the Community College,” New Directions for Community Colleges, No. 175 (Fall 2016): 33-44. Alamuddin, Rayane and Melissa Bender. "The First-Year Experience in Two-Year Public Postsecondary Programs: Results of a National Survey." Ithaka S+R . Last Modified 26 September 2018. https://doi.org/10.18665/sr.309318. With support from the Jack Kent Cooke Foundation and in collaboration with TYFY, we are undertaking a national landscape study of community colleges.